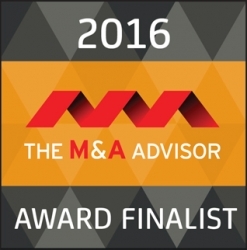 Chicago, IL, August 29, 2016 --(PR.com)-- The M&A Advisor has announced Chicago based international investment banking firm, Madison Street Capital, as a finalist for the 15th Annual M&A Advisor Awards. The awards, widely respected as a pinnacle of achievement in the financial industry, recognize excellence in deal making, restructuring and financing, celebrating the contributions and achievements of leading firms and professionals. Madison Street Capital has been nominated for both Boutique Investment Banking Firm of the Year - International and Industrials Deal of the Year (Under $100MM). The latter recognized Madison Street Capital’s role facilitating the Acquisition of Acuna & Asociados S.A. by Dowco. Madison Street Capital Senior Managing Director Karl D’Cunha led the transaction. “The Acquisition of Acuna & Asociados S.A. by Dowco was a complex cross-border transaction with many moving parts. It feels great to be recognized for that achievement,” said Karl D’Cunha, Madison Street Capital Senior Managing Director. The winners of the awards will be announced at the 15th Annual M&A Advisor Awards Gala on Wed., Nov. 9 at the New York Athletic Club.